Education and sharing knowledge has always been at the forefront of everything we do at Zerodha. Over the years, we have done this relentlessly via various channels and formats – Varsity, Webinars, TradingQnA, Z-Connect itself, and through partner platforms such as LearnApp. We are now pushing ourselves to take this effort to a whole new level. After 14 months of painstaking efforts, we are finally happy to announce the launch of ‘Varsity Mobile App’. 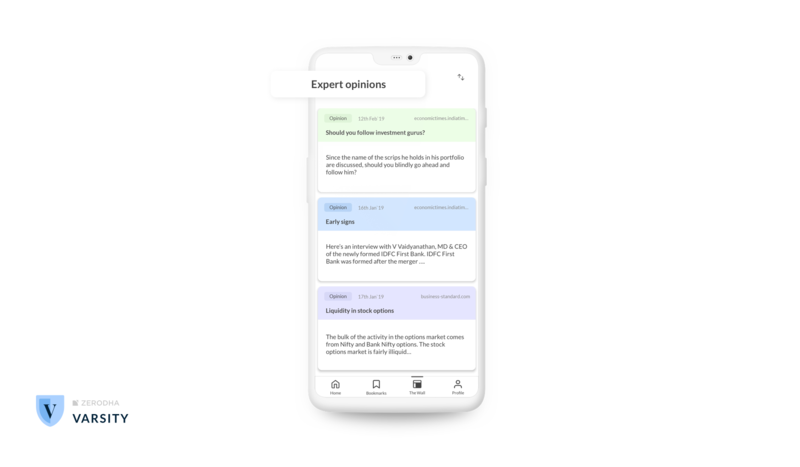 Zerodha Varsity, as you may know, is our flagship educational initiative, which provides you with highly structured and detailed notes about literally everything you need to know about trading and investing. This is available online and is free to access for all. 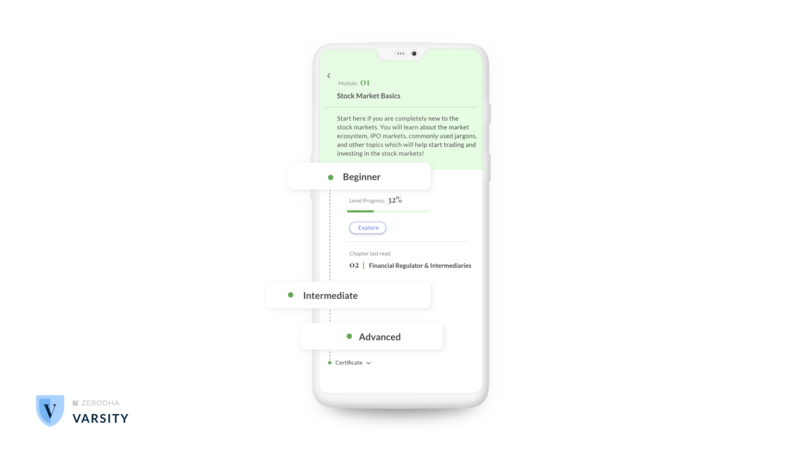 We now have a mobile avatar of Zerodha Varsity, which retains the goodness of the rich content of the Varsity web version plus introduces several features which enhances your learning experience. Click on a module that you like to start reading. The content is broken down into three levels of difficulty namely, Beginner, Intermediate, and Advance. Choose a difficulty level to start learning. Each difficulty level has several chapters with bite-size cards for the ease of learning. All the content is neatly organized to ensure continuity in learning. Set up daily goals to not just accelerate your learning but also stay consistent at it. 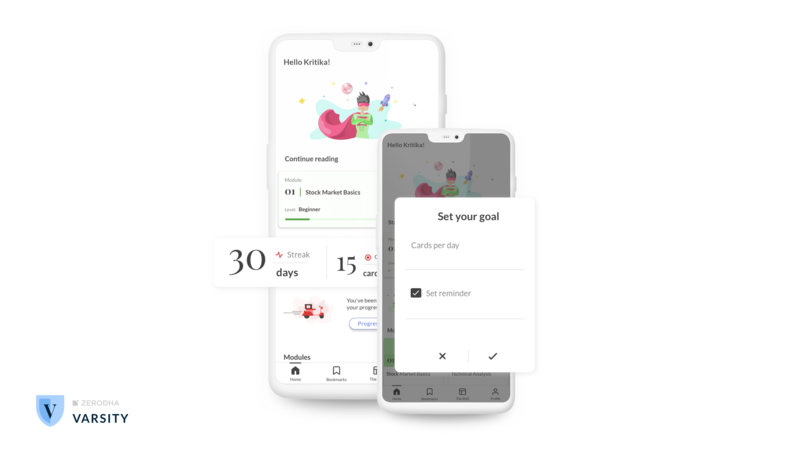 Streaks help you figure out the consecutive number of days you’ve managed to hit your daily goals. Your objective should be to maximize your streaks. This is an interesting feature. Test your learning at the end of every level by taking up the quiz. Since every module has three levels of difficulty, there will be three quizzes. Make sure to give your best attempt at the very first shot. 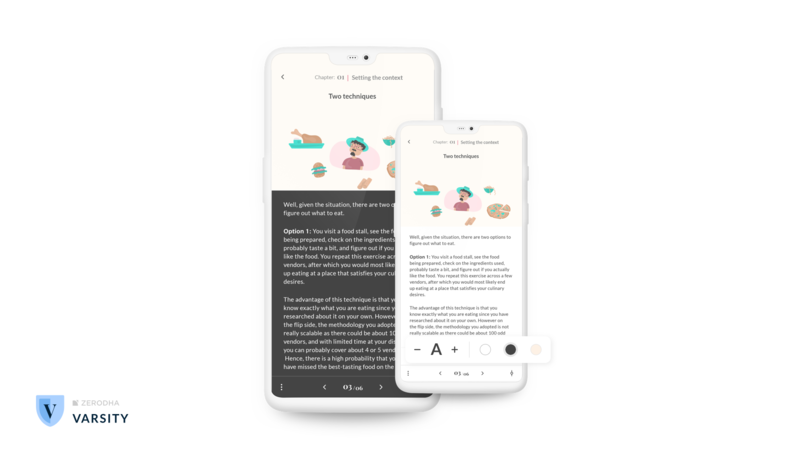 Subsequent quiz attempts will reduce the points scored per question, so it is in your best interest to give your best shot at your first attempt. 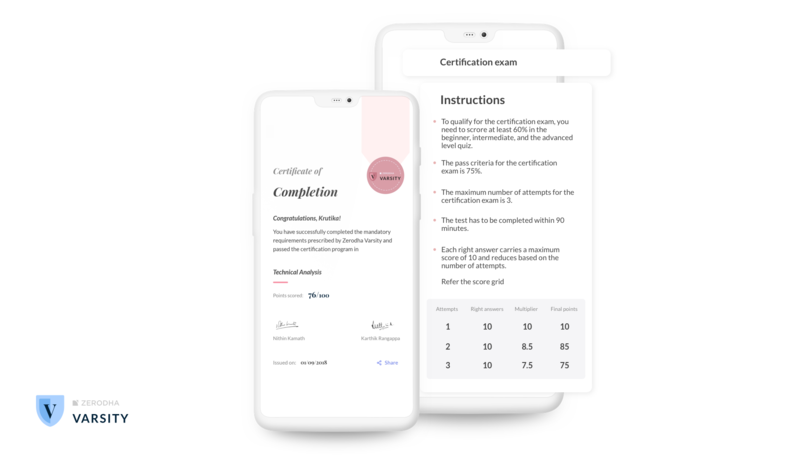 Unlock the certification at the end of every module. However, Varsity Certification won’t come easily to you. You need to score a minimum of 60% in each of the three quizzes plus 60% on the certification exam itself. This is a unique feature and we are quite proud of this. The Wall is a place where industry experts (on invite basis) share their views and opinions on events panning out in the markets. Or it could simply be their opinion on an article. The idea here is to link their view to related concepts and transform your learning experience. Don’t like reading in all white? Switch to dark or sepia mode. Switch to a theme you like. You can play around with the font size too. And there are plenty of other features, which we are sure you’d appreciate. For now, the app is available only on the Google play store, but we are working on the iOS version as well. The iOS version should be available over the next 2-3 months. Thanks to team zerodha and karthik rangappa for sharing all the knowledge for absolutely free! so easy to read on the mobile app now. Phenomenal. Appreciate Zerodha’s efforts for this. Nice. Thanks for sharing. Kudos to Zerodha team. Awesome … great effort, much appreciated !! Working on it. Should be out soon. Zerodha is always eager to take new initiative to help investors and traders. Great application. Thanks Karthik Rangappa & team zerodha for providing extra knowledge gaining services that no body is providing in this industry for free. Congratulations to zerodha team, for such a informative app. just need to know when are you guys releasing it for iphone users? thank sir , i am waiting for very long time. I can go on… but Kudos to you for the passion with purpose. Do what is necessary… Do what is possible – and Soon… You will do the Impossible. Hi Karthik, and Nithin…. Congratulations to both of you on this new milestone. Zerodha rocks !! Any plan for lauching it on IOS. Kudos to Zerodha for their efforts towards investor education. Very helpful app for learning . Zerodha is best , please don’t change the way you are. Thanks to Karthik and Zerodha team for bringing it to the app. It would be an amazing source of learning for beginners. 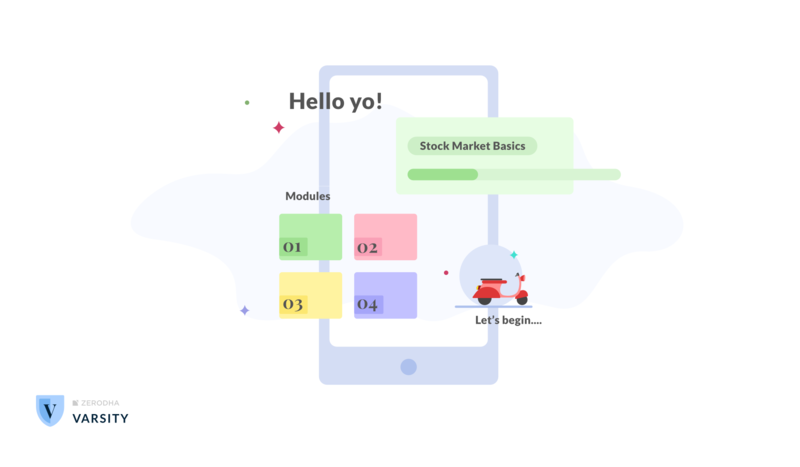 I am beginner to stock trading and I hope this APP will help me to learn and understand about stock market, technical analysis and investing in all segments. Thanks to Zerodha for launching this learning platform in mobile APP. Why this App is not supporting for my android version (KitKat 4.4.4). I am Redmi 2 smartphone. Hey Chaitanya, the minimum Andriod version required to run the app is 5.0. When will you release kite 3.0 mobile app. Hey Dharmendra, it’s already available on both, Andriod and iOS in beta mode. You can go to holdings and hit exit for that stock. Or, you can place a CNC sell order from the marketwatch. You are really a great. your brokarage is very high sir showing 0.01% and taking 100% my benefits. Is this doing froad with customer. Please check my account for brokarage. You’ve placed nearly 600 orders, and you were charged Rs. 68.21 as brokerage for them. I think there’s an error in your calculations here. Please check your contract note. Hey Mahesh. best create a ticket on our Support Portal for this. Good app and good initiative.May I know when we will get IOS version. I feel that zerodha should start separate app like Coin for Govt Bonds & T bills. 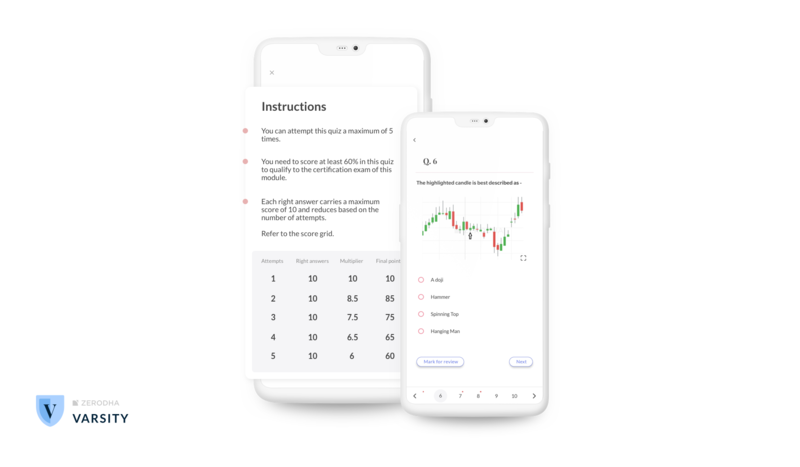 The idea is to make Coin the go-to app for all longterm investments other than stocks. Is Zerodha Varsity app is abailable on ios ?? Looks like you have proceeded beyond this step, Your application is under rejection, the details are sent to your registered Email. Do follow the guidelines mentioned there , the salesperson will also be reaching out to you to assist. Varsity is not available for ios.